Yesterday marked the start of a brand spanking new year... and also the start of Miss 2's toilet training adventure. I am super excited as this is the last child I will EVER have to toilet train - yipee! 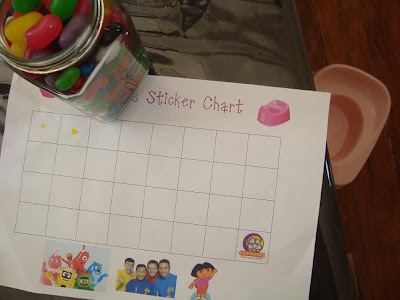 As you can see from the photo above, we are all set for toilet training bribery... a giant jar of jelly beans, one pretty pink potty and a very cool sticker chart with a visit to Chipmunks as the goal at the end. My journey of toilet training our kids (with hubby's help of course) hasn't been all plain sailing... one of our children was a total horror to train (I started training him nice and early and he was in too much of a rush with life to really even bother to try), another was a perfect dream and then another was great until we moved house and had a new baby arrive all at the same time - then everything went downhill from there (including things getting slowed down further with some medical issues). Miss 2 has been showing the signs of being ready for months now but this time I decided not to rush into toilet training - I decided to wait until summer, when Christmas was over and we had a nice quiet week or so to settle into the new phase. And so far it's been great - no little accidents on the floor and plenty of stickers and lollies being rewarded... I almost can't believe how great it's been. It's great to know that my little girl is now using the toilet for what it was meant to be... rather than for cups of tea! All the best! We are toilet training our youngest too...going ok...have lost count what "take" we are on. All the best! When they are done, it is hard to imagine we spent so much time sweating over it! oh the adventure of toilet training!!! However,i have a feeling that LIttle Miss 2 is not going to give you much trouble. hey does everyone who comes to your house,and goes in the potty get jelly bean???? It's so great that it's going so well for you! :) I'm planning to start with our little guy in a few months or so.... but I'm not really looking forward to it. Well done Miss nearly 3 year old, Mum wont know herself with no more nappies.